I have had several opportunities to be civically engaged while at SLCC, primarily by taking service-learning courses. In my Geriatrics class, we did a number of projects for elderly residents of Salt Lake City. These included bringing meals to them throughout the semester, talking with them, and raking leaves for them in the Fall. These activities were very pertinent to the class, because we got to interact with many elderly folks and that helped make personal our reading in the textbook. So many of these people do not have extensive social networks, which research has found to be so important to the length and quality of life for elderly people. I’m including a picture of us students raking leaves at Mrs. Brown’s house. She invited us in for punch afterwards. In my Building Construction class, we worked on a Habitat for Humanity House in Salt Lake. The foundation was already done by the time we started working, but we got to work on the framing, putting in the windows, the siding, and the painting. I’m amazed at how much math goes into building construction! The Habitat foreman was great, and I think he appreciated all the work we did. We met the family who is going to occupy the house, and they were really cool. They have to put in so many hours of “sweat equity” in order to qualify for a Habitat Home. 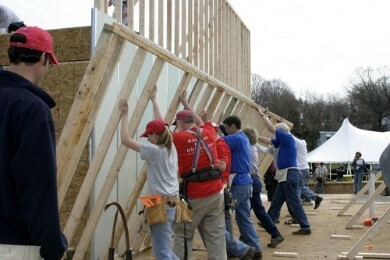 I’m including a picture I took of students in my class raising a wall of the Habitat house.